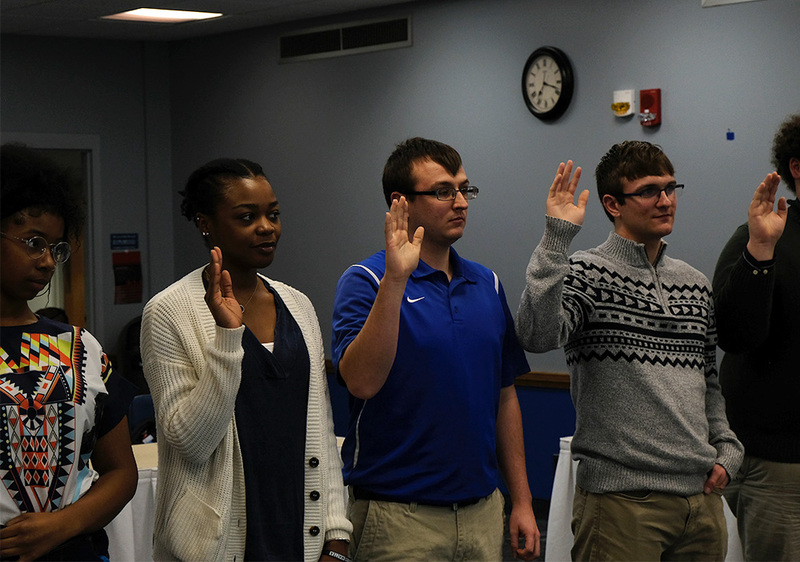 New members for Student Senate are sworn in Wednesday night at the meeting in the Martin Luther King Jr. University Union. Jennifer O’Boyle, a German major, adresses the senate about her proposed RSO Wednesday night at the Student Senate meeting in the Martin Luther King Jr. University Union. Student Senate approved seven out of nine student organizations proposed at the hearing Wednesday night. The Senate voted to table the remaining two student organizations until next week’s hearing. 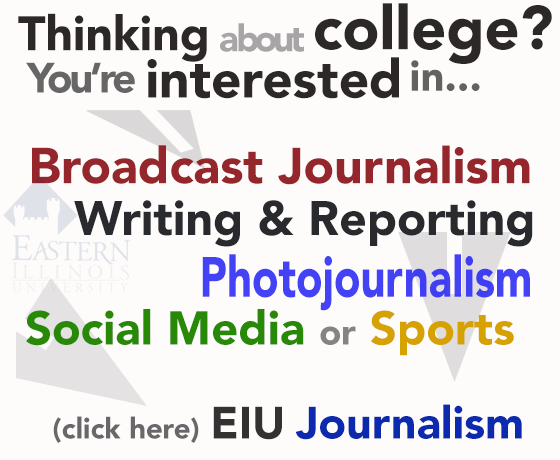 Approved RSOs include Biology Ambassadors at Eastern, Percussion Club, E-Sports Club, Human Services and Community Leadership Ambassadors, Environmental Biology Club, German Club and Cloud Appreciation Club. Senator Seth Yeakel said ambassador organizations such as the Biology Ambassadors and the Human Services and Community Leadership Ambassadors are some of his favorite student organizations because they help Eastern to further expand and improve. “I believe that ambassador clubs … are the next step in Eastern to grow and get more students to come,” he said. Alicia Matusiak, vice president of Student Affairs, said out of all the student organizations that proposed at the hearing, she thought the Cloud Appreciation Club was the most interesting. “I think the Cloud Appreciation Club stood out to me just because I’ve never heard of an organization that covered that, but there are so many needs of students on our campus, I’m happy that they’re taking advantage of becoming an organization of people who love clouds,” she said. The student proposing its approval to the Senate described InterVarsity Club, one of two student organizations to get tabled, as a Christian Fellowship. 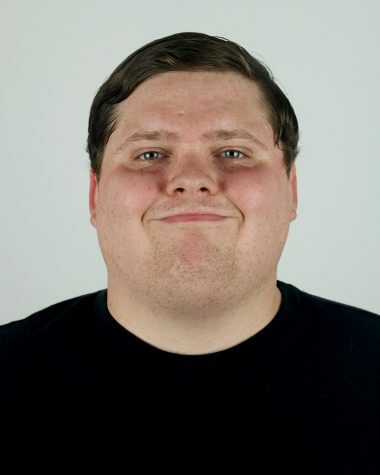 While the student organization’s representation said the club was welcoming to the entirety of the student body regardless of faith or denomination, its constitution exemplified that statement was “contradictory,” Matusiak said. According to the club’s constitution, the organization is for Christians specifically to get together to understand the Bible instead of encompassing students of any religions or denominations. Matusiak said she recommended the senate table the student organization until more information was available. Thus, the senate voted to table the club, reserving it for next week’s hearing. The other student organization that senators voted to table was the Japanese Club. Executive Vice President Zachary Cohen informed senators that because the Japanese Club’s proposal had no student representative at the meeting, the option to table it was valid; thus, the senate voted to reserve approval or denial of the registered student organization until the next hearing. Student Senate speaker Tarve’a Durant said senators will also host a tabling at the University Food Court at the Martin Luther King Jr. University Union Feb. 12 from 11 a.m. until 2 p.m.
At the tabling, Durant said interested students not affiliated with student government can fill out comment cards detailing what specific events and activities they would like to see on campus. 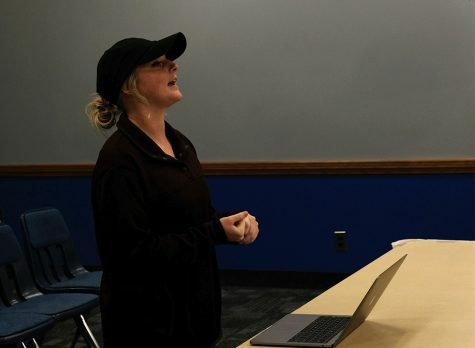 One of the main goals of Durant and the rest of Student Senate is to get more students interested in attending the meetings every Wednesday at 7 p.m. and getting involved in student government, which is what the tabling is geared to help make happen, he said. An important issue Durant brought up at the hearing was the importance of student senators attending the events for African-American Heritage Month, he said. “Not really a lot of senators were (at the African-American Heritage Month events). I just feel like it’s important (for student senators to attend) because we, as student representatives, make important decisions on things like the Black Lives Matter Flag; we make important decisions on things like that, so it’s important to show up,” Durant said.